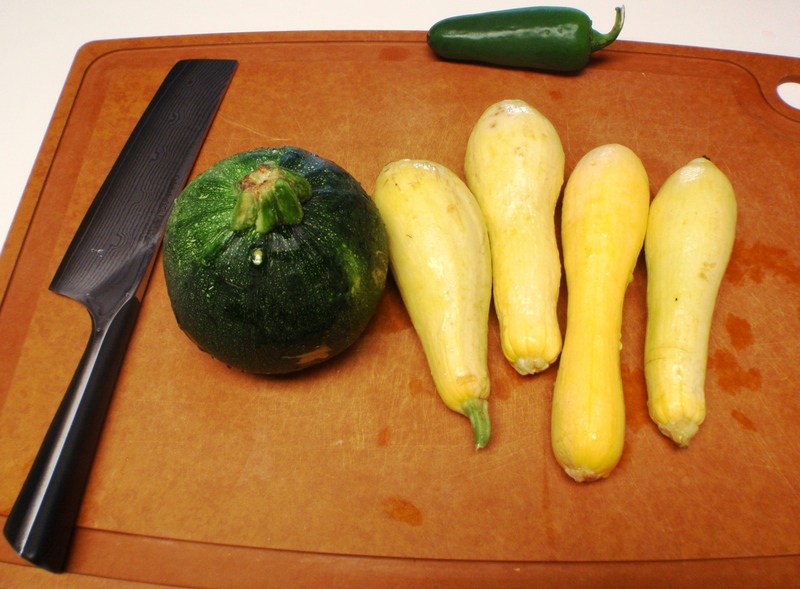 We made mashed squash again last night – thank you Phyllis for the veggies! 🙂 I could eat the whole pot by myself this stuff is so good. I am not missing mashed potatoes in any way when I can get my hands on this. Don modified his recipe a bit again. There may have been something else he tossed in that I didn’t see but I’m fairly certain that even just these ingredients would make for good eats. 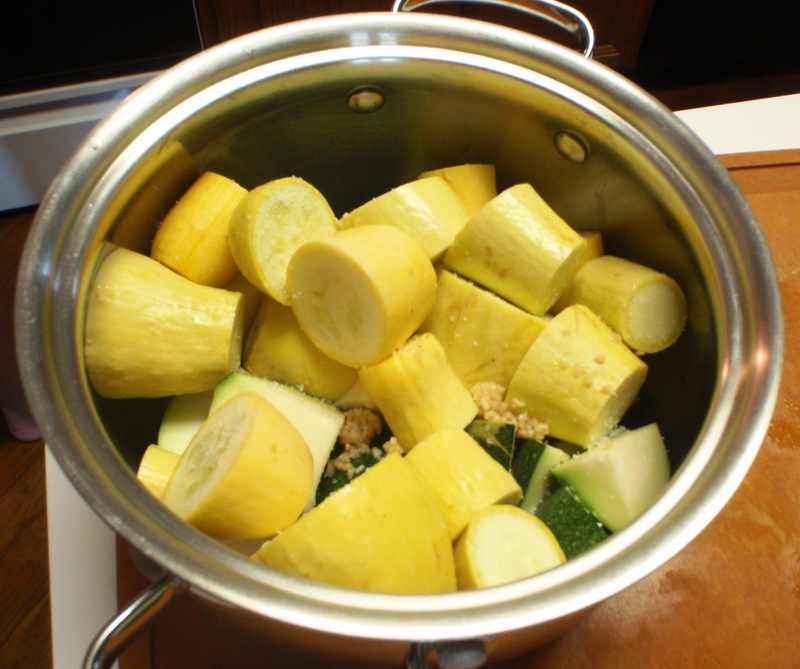 Cut your squash and zucchini into chunks and fill the pot about halfway with water. 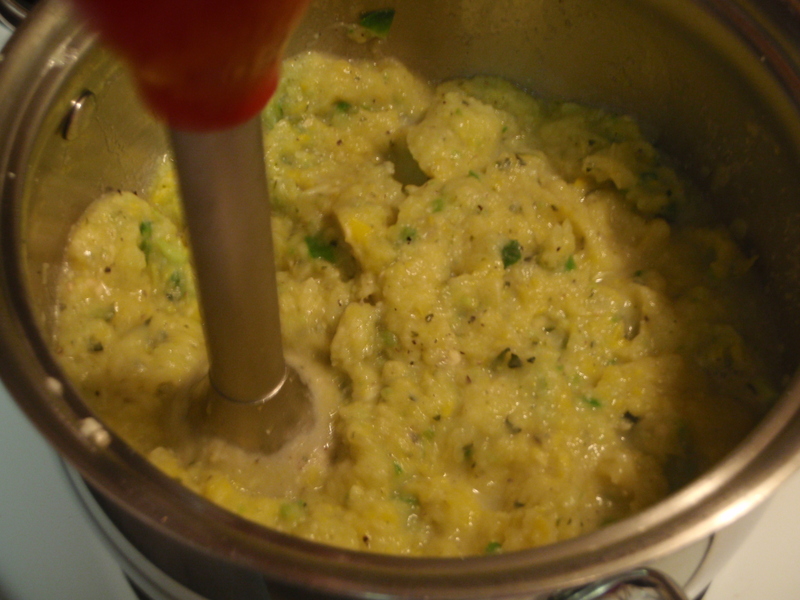 Steam on medium high for about 15 minutes or until soft enough to mash. 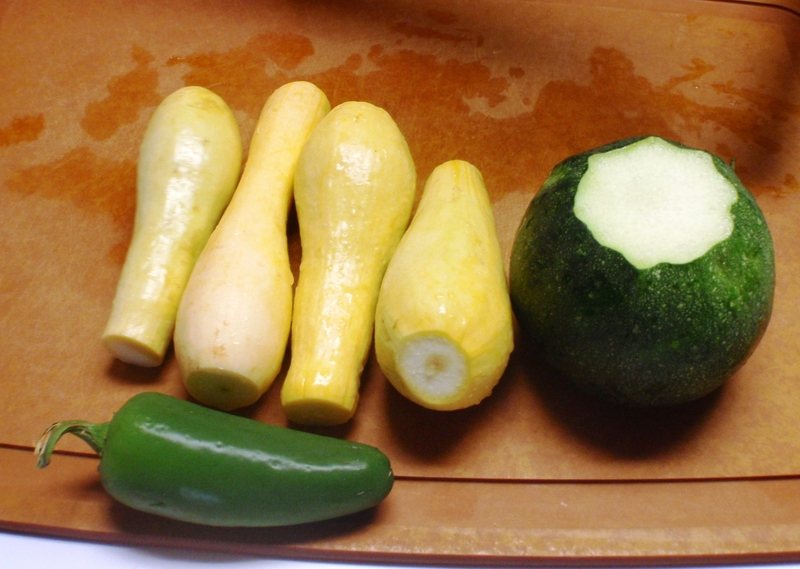 Drain the water and add the remaining ingredients: jalapeno (diced and keep the seeds if you like it spicy like us), sour cream, avocado, salt, garlic, butter, almond flour, and anything else you’d like, to taste. 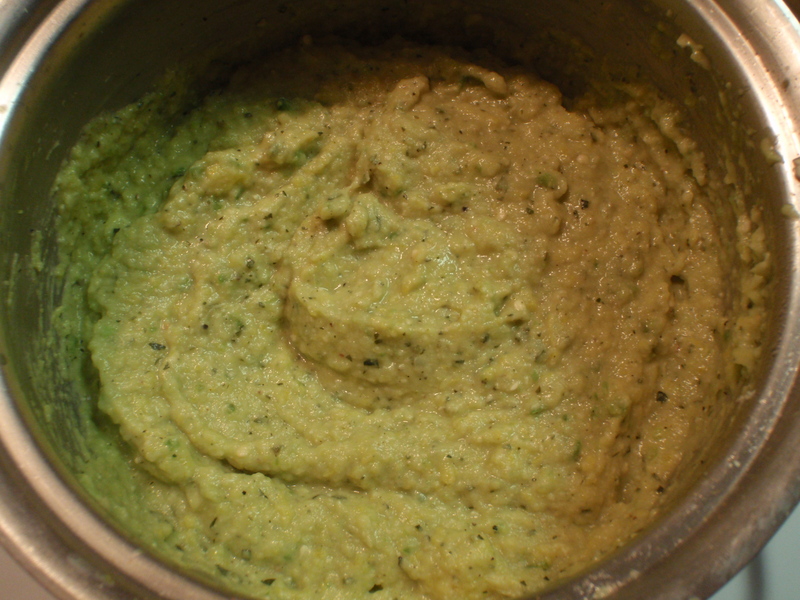 It might look like pureed baby food, and green to boot if you add avocado, but let me tell you, it’s packed with flavor and goodness! 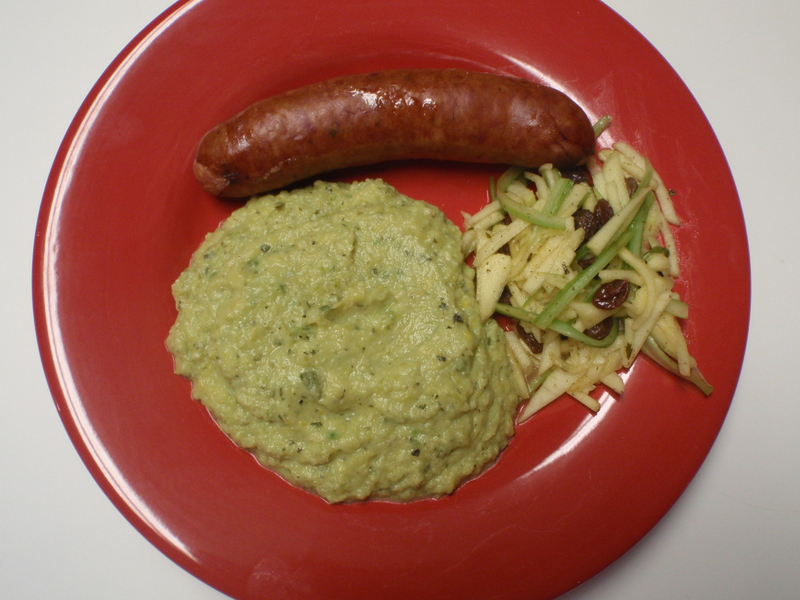 We paired our mashed squash with jalapeno sausage, and my apple-celery salad from Saturday. 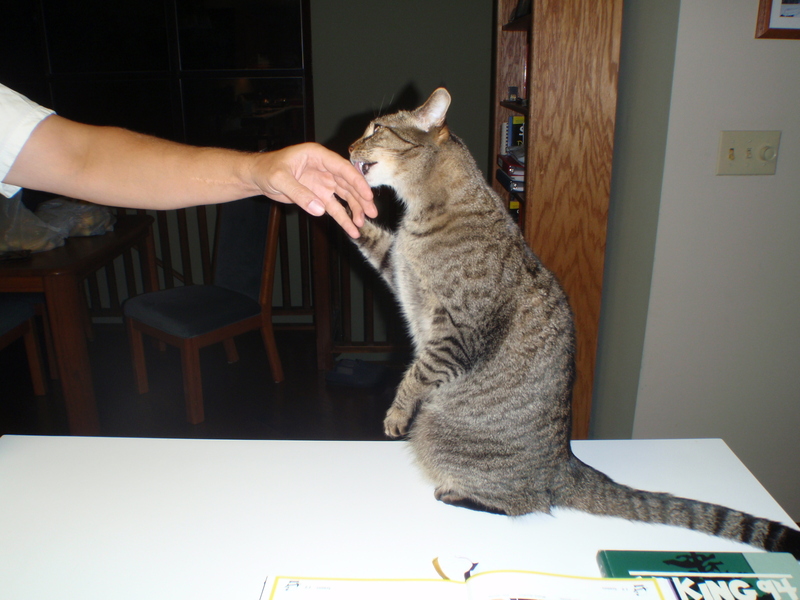 Mmm, good. 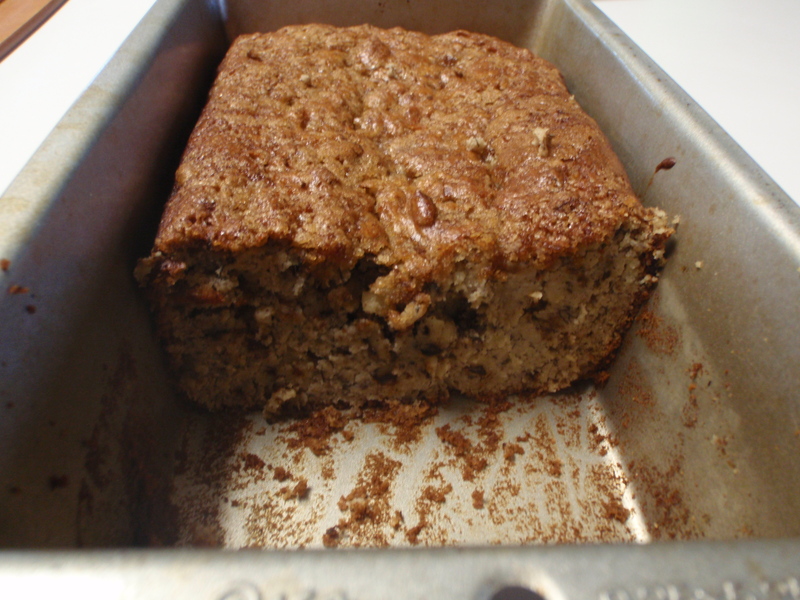 I also made another banana bread yesterday. 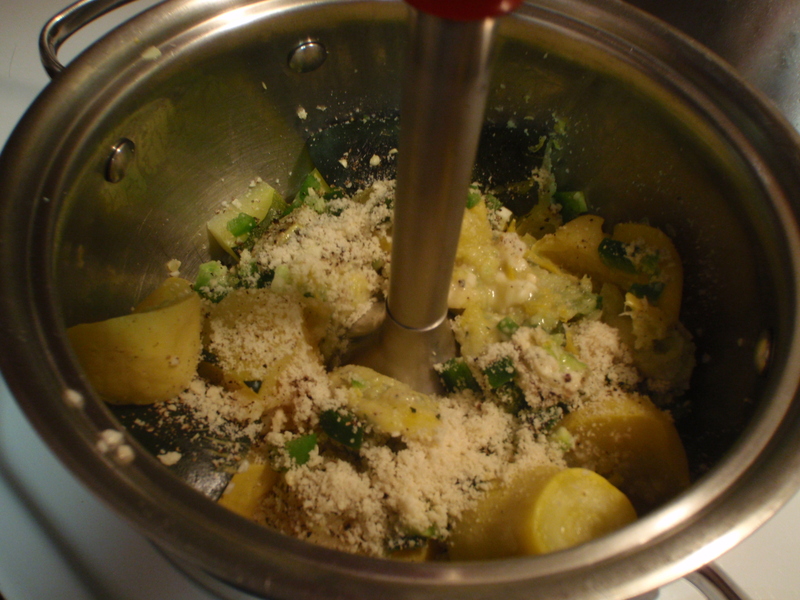 I realized as I got everything together that I used twice as much butter as the recipe calls for last time. LOL No wonder it wouldn’t set up well! I corrected that error this time around and I added about a tsp of baking powder as well. It turned out much better this time. It’s not as big and beautiful as my trusty old recipe, but it tastes great which in the end is all that really matters anyway. After dinner last night we watched Food Inc. on Netflix. Wow. I hardly know what to say. Take some time to watch this film. It is disturbing on so many levels but the information is something every person should know. We should all know where our food comes from, how it is produced, what companies are involved, and how politics and our government are involved. This film touches on all these things and more, and of course it’s only a small portion of the bigger picture but that’s ok. It gets you thinking and looking at things differently and that’s a good starting point. Don and I have been shopping more organically in the last few months and our meat is mostly natural fed deer or hog that Don has hunted himself. But we do still buy bacon, chicken, and the occasional beef at the grocery store. Grass-fed farms are mentioned by a lot of primal bloggers that I follow, and they’ve been touched on in other food documentaries we’ve watched, but before this film we’ve never seen anything that pushed us to make a change in that regard. We have allowed ourselves to be put off by the assumption that it would be expensive and excessive. Now, regardless of cost, we will be making an effort to find local grass-fed, organic farmers, and making more trips to the farmers market on Saturdays. It is worth the effort and a little extra cost. Watch the film and see if you agree. Support your local farmers in whatever little ways you can and be part of the change that needs to come to this country in terms of food production and distribution. Every little bit helps and contributes to the larger whole which can make great strides toward change. Organic farming has been shown to provide major benefits for wildlife and the wider environment. The best that can be said about genetically engineered crops is that they will now be monitored to see how much damage they cause. We watched another great documentary this week, Food Matters. It’s about food, pharmaceutical drugs, vitamins/supplements, and how all these things affect us and our bodies. Films like Food Matters, Sugar: The Bitter Truth, and FatHead, and websites like Mark’s Daily Apple, have really opened our eyes and made us see that we were walking through life blind. It’s a bit shocking. We always thought of ourselves as healthy and fit but we were missing SO MUCH. We thought we were eating pretty healthy (low-fat, whole grains, traditional food pyramid style). Throw in some major cardio sessions to burn those calories. But guess what? The concept of calories in-calories out is not truly accurate. And, I had no IDEA high fructose corn syrup was so freaking bad for us! Blind, blind, blind. We feel like we are headed in the right direction now as we explore eating organic/natural foods and eliminate processed foods as much as possible. After about a month of making significant changes to our pantry and our cooking, we’ve both lost weight without any effort, and we feel amazing. We aren’t craving the foods we’ve given up, we aren’t counting calories, we aren’t constantly hungry like with traditional diets (which, just to be clear, we aren’t dieting, we are just eating differently, forever), we are having great fun exploring new flavors and new ways of preparing foods, and we don’t regret the choices we’ve made one bit. A note to the skeptics/critics because I know what you’re thinking…just because we say we are not eating certain things anymore, it’s not like we never eat them. We are aiming for an 80/20 primal/conventional approach to our food and drink. We still enjoy a good cocktail, and we still enjoy an ear of corn, or a piece of cake from time to time. It’s all about balance and, truly, it’s been pretty easy to be 80/20 and and not feel like we’re missing out on anything. We found Food Matters through Netflix but I’m sure that’s just one of many ways to view it. Take some time to check it out. I bet you’ll learn something new. If we all did the things we are capable of, we would astound ourselves. ...to my random musings on the ordinary, and sometimes extraordinary, adventures of a family of two. I am a participant in the Amazon Services LLC Associates Program, an affiliate advertising program designed to provide a means for sites to earn advertising fees by advertising and linking to Amazon.com. This means that some of the links in my posts might redirect you to Amazon and if you decide to purchase an item I linked you to, I might receive a commission. Want to learn more about primal or paleo living? Check out these great resources and recipe sites.